Home Career Bachelor Of Education Eligibility Critria , Syllabus nd Jobs . 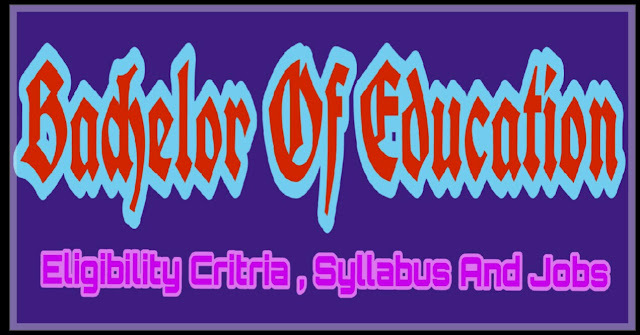 Bachelor Of Education Eligibility Critria , Syllabus nd Jobs . B. Ed . Stands for Bachelor Of Education , B. Ed . is a professional undergraduate bachelor degree program . B .Ed. is a best option for those aspirants who want to setup their career as a teacher and field related to teaching . B. Ed . is mandatory course for teching higher primary schools and high school. ◆ Those students who completed Bachelor Of Science , Bachelor Of Commerce Or Bachelor Of Arts from a recognized University and obtained minimum 50 % marks can apply for B. ED. ◆ Students would have pass through entrance test and must score high in entrance test for admission in B. Ed. In Australia, B. Ed. is a four year bachelor degree program which combines practical/pedagogical study with a Major sequence in the academic discipline of Education. In the most universities of Australia , there is usually 2 distinct types of the Bachelor of Education :- Primary and Secondary. Both contain different subjects and degree programs . In Bangladesh, For hons. B. Ed. is four year and for diploma is one , two or three years undergraduate professional degree program in Education offered by the authorized Teachers Training Institutes or Colleges for those aimed their profession as a Teacher. In India , B.Ed. is two year postgraduate course for those interested students who want to setup their career in teaching. The B.Ed. degree is mandatory for teaching at the secondary and higher secondary. The students interested in B. Ed. minimum qualification required for entry into B.Ed. course is Bachelor of Arts , Bachelor Of Commerce or Bachelor of Science . In Ireland, B. Ed. Is a four Year bachelor degree program which combines practical/pedagogical study with a Major sequence in the academic discipline of Education. Modules in the Irish and English languages are compulsory. In Israel, B.Ed. is a course is for those aspirants who are interested in developing the field. Developed unique training programs tailored contemporary trends in professional training for teaching. In New Zealand , B. Ed. Is three year bachelor degree program which prepares graduates to teach in early childhood centres, primary and intermediate schools. In Nigeria, B. Ed. is awarded at Universities and Colleges of Education across the nation as a first degree. There are a few specialised Universities of Education in the country that exist to train teachers professionally. In North America, B.Ed. is awarded for coursework completed within a program lasting one to five years, depending on the requirements established by the place where the province or state in which the university is located. In Canada, a B.Ed. degree is required for teaching certification. B. Ed. degree was first introduced by the University of Ceylon (Sri Lanka) in 1963. Prof. J. E. Jayasuriya, then Professor of Education at University of Ceylon introduced the course to meet the growing demand for professional teacher qualifications. Then the practice was to join the teaching profession with a bachelor's degree either in Arts or Sciences and after four years of teaching in a Secondary school teachers get the One year Post-Graduate Diploma in Education. In the United Kingdom, where the university and school both systems are very different, there B. Ed. degree is a three or four year course the duration of the course depends on the university which is specifically tailored to either primary education or for a limited range of secondary education subjects. It leads to Qualified Teacher Status (QTS) in England and Wales and is a teaching qualification in Scotland and Northern Ireland. Education Nature and Purpose, Knowledge and Knowing, Forms of knowledge and its organization in schools, autonomy of teacher and learner, education and values. This course deals with providing the conceptual understanding of aspects related to teacher- education. Learner as a developing individual, development and learning, theoretical perspectives on learning, learning in constructivist perspective, individual differences among learners. This paper deals with the idea of individual development of the student in understanding the basics required to be teachers. Socialization and development of self, emergence or ‘person’ and ‘identity’, schooling and identity formation: a critical study, coping with social complexities: role of education, evolving and identity as a teacher. This paper deals with the issues related to school and the social environment essential to the understanding of a teacher. This course deals with the understanding of subjects through a pedagogic approach. This is the basic level of subject knowledge and deals with the theoretical study of these subjects in the light of the pedagogic requirements. This is the extension of the previous course; it provides a hands-on experience to the students in real life classroom situation. This course provides an understanding on the importance of assessment, and the basics of how to effectively plan the assessment in any academic year. Engaging with narrative and descriptive accounts, engaging with popular subject-based expository writing, engaging with journalistic writing, engaging with subject- related reference books, engaging with educational writing. This course is an experiential course which fully focuses on the learning of the subject areas in classrooms. As the name suggests, this paper deals with the effective communication on the part of the teacher during the classroom teaching. Theory based on concepts of holistic health, collective responsibility, understanding the body, food and nutrition, physical fitness, role of institutions. It is an integrated understanding of health, diseases and fitness among children and encouraging healthy habits among them. Library policies, library as a resource, types of books, locating information. This course aims at developing an understanding in the student-teacher to know how to best use the resources available in the library. Understanding peace as a dynamic social reality, understanding conflicts, personal-social processes, meditation, and transformation of conflict, empowerment of self through critical self reflection, orienting education for peace building, evaluation of the peace building processes. The aim of the course is to make the student-teacher understand the concepts of peace education through various processes. Practical activities are also taken up in this course. Importance of conservation, community participation, consumerism and waste generation, environmental conservation, role of women. Conservation of the environment is one of the core areas of study in this course. The National Policy on Education makes the environmental education as one of the major courses in B. Ed. Interaction with students, observation of various departments, on-site interaction with staff. This is a kind of on-site training mandatory for every student-teacher to learn about the practical experiences and application of the theoretical knowledge in the practical school atmosphere. Concept of Curriculum, curriculum determinants and considerations, curriculum development, school: the site of curriculum engagement, curriculum implementation and renewal. The course aims at making the student-teacher understand the importance of a proper curriculum and how it is prepared and implemented. Normative vision of Indian education, vision of education: four Indian thinkers, contemporary Indian schooling: concerns and issues, education and development, emerging global concerns and education. The focus of the course is to acquaint the student-teachers with the contemporary education reality. It is the advanced level course in pedagogy which deals with planning for teaching-learning, learning resources, assessment and evaluation and the professional development of teachers. Examination system: a sociological and psychological analysis of the related issues, school-based assessment and evaluation: policies, practices and possibilities, examination reform efforts, directions for examination reform. This paper is necessary in understanding the various aspects related to assessments. The major focus is on the examination and evaluation system in schools. On-site practical experience through various tasks. It is an internship program of about two and a half months where the teacher-students actually teach in a school. Relevance of ICT in education, visualizing learning situations using audio-visual and other media, use of computers in schools, visualizing technology supported learning solutions, Indian and international experience in ICT-aided learning. This paper is about the importance of ICT in education and focuses on the appreciation of the computer technology in learning processes. Human body, diseases, dietary requirements, pollution, health hazards, games and sports, physical fitness, yogic practices. The paper deals with making the student-teacher understand the concepts related to health and healthy living. Visual arts and crafts, performing arts, appreciation of arts (theory). This paper is meant to bring out the creative aspects of the student-teacher through practical classes and theory of arts. Key concepts, gender studies- paradigm shifts, gender, power and education, gender issues in curriculum, gender, sexuality, sexual harassment and abuse. This course deals with all the aspects related to the gender issues and how they relate in the educational field. Paradigms in education of children with special needs, legal and policy perspectives, defining social needs, inclusive practices in classroom for all, developing support networks. It deals with the understanding of teaching techniques used for students with special needs. Written report and a presentation. During this session, the student-teacher has to make a report of all the understandings of the two year program and present it too.